Starting this month, you can now treat your skin to Sunday Riley formulated skincare products on board and in United Polaris® lounge locations. A pioneer in the Green Technology field, Sunday Riley products combine advanced actives and purified botanicals to truly transform your skin. A female-founded and led business, Sunday Riley is growing rapidly with an expanded reach across North America, Australia, Asia and Europe. Viewing skincare as an extension of self-care and overall wellness is something the brand recognizes especially when taking care of oneself on the go while traveling. Soon, you'll see Sunday Riley on board for customers traveling in United Polaris business class, United Premium PlusSM, and on our premium transcontinental flights. There will also be new onboard lavatory skincare products in addition to new skin and bath items in our United Polaris lounge locations. All skincare is formulated by Sunday Riley exclusively for United with hydration in mind to meet a flyer's need for increased moisture as they travel. United Polaris amenity kits will feature four skincare items: A lip balm, face moisturizer, hand cream and a facial cleansing cloth. United Premium Plus amenity kits will include a lip balm as well as a hand cream. Our premium transcontinental amenity kit will include a lip balm. Onboard lavatories will include a face mist and hand cream. We're thrilled to be bringing Sunday Riley products on board and into our lounges. We have partnered with TSA and are working closely with them to bring new technology to security checkpoints, which will help reduce processing times and provide more information to those waiting in line. In February at Chicago's O'Hare International Airport, we launched a new wait time display system that helps inform passengers of expected security wait times and to further help them find their way to the correct checkpoint on their boarding pass from wherever they enter our lobby. This innovative new technology calculates expected wait times by monitoring passenger throughput in each checkpoint. Screens positioned throughout our Terminal 1 lobby inform passengers of expected time to clear the security process, while also helping them navigate to the three different checkpoints in our lobby – Premier, PreCheck, and standard screening. 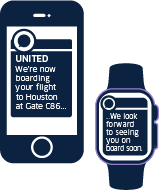 "Our new wait-time system now allows us to provide passengers with timely security information and peace of mind as they walk into the lobby and begin their journey, emphasizing our core4 standards of caring and efficient in another key part of the travel experience," said United's Customer Service Delivery Innovation Senior Analyst Paul Schrader. The wait time display system will also help TSA optimize its resources by providing insights into checkpoint performance metrics and is just the latest in our other partnership efforts with TSA at O'Hare, including testing computed tomography scanners and installing Automated Screening Lanes to improve the screening experience. Customers can currently see estimated wait times on our websites for Denver International Airport and San Francisco International airport. We are constantly assessing ways to improve the security experience for our customers, and the long term goal is to have wait time display systems active at all of our domestic U.S. hubs. The beginning of the year is the perfect time to reflect on what's working and not working when it comes to travel habits and your travel routine. Here are seven tips to consider before you travel next. For those who travel internationally, Global Entry will make your travel experience feel like a breeze. With expedited clearance privileges, you'll be able to skip long customs lines when entering the U.S. from international destinations. To apply, you'll need to complete a background check and an in-person interview. The membership costs $100 for five years. And the bonus: TSA Pre✓ ® is included. Earn award miles through a great selection of credit card products including the United℠ Explorer Card and the United MileagePlus® Club card. From free checked bags and priority boarding to United Club℠ passes and Premier Access®, you'll find an award program that fits your travel needs. You don't have to have status to get into one of our United Club℠ locations, either. Purchase a one-day pass for $59 through the United app or at the lounge's front desk. Once inside, you can recharge in comfortable seats, grab a bite to eat, enjoy a complimentary beverage or catch up with work. Gate Guru, which gives locations of restaurants and stores at the top airports in the world. There are also user reviews, and sometimes you can even get a discount coupon. Packing Pro, for those who want to be more organized when trying to decide what — and what not — to bring on a trip. There are customizable and sample packing lists that cover every contingency. United, may be thought of as solely a way to book flights and check in, but the app actually has a number of additional features, including a currency converter, airport maps and much more. Now that you've downloaded an app to help you pack smarter, next up is packing lighter. We've all overpacked at some point in our lives, but the trick that savvy travelers exercise when flying is that they always pack less. Try to maximize your carry-on for shorter trips and repeat outfits when going on longer trips. It may seem counter intuitive, but packing lists can be helpful — especially when planning out a longer trip where you'll be going from city to city lugging around a suitcase. Trust us, your back and travel companion will thank your future self. It goes without saying, but just in case it's not on your list, you should always photograph your travel documents including your ID and passport. You may take every precaution out there, but sometimes the unpredictable happens and your passport goes missing. Instead of scrambling to produce another copy, you'll rest assured with the second copy you made sure to pack away from your passport in case your luggage or personal backpack is stolen. This may seem like an obvious tip, however, each year more than 700 million vacation days go unused in the U.S. If you've got the days, you should be using them. A long weekend trip offers you the chance to take a break from work and recharge, while also exploring a new city. Whether you visit a neighboring state or go abroad, you'll be able to get out and experience a new part of the world. If you fly regularly, one terminal starts to blur into the next. But next time you're flying through one of our hub airports, take a minute to check out some of these unique features. You won't need an airplane to be transported around the world — just step into Terminal C's Global Bazaar at Newark's Liberty International Airport (EWR). Tsukiji Fishroom features sushi made on-site with the freshest fish flown direct from Tokyo. Slurp ramen with hand-pulled noodles at Kaedama. Choose from sweet or savory at Creperie Juliet with options like S'mores Chocolate & Marshmallow and Mushroom, Spinach & Cheese. Or get your early morning fix from Poppy's Bagels. You'll find endless options in this food hall designed specifically for the on-the-go guest. Contemplate life as you enter Los Angeles International Airport (LAX). You'll encounter Gary Brewer's "Across the Universe" in the Terminal 7 ticketing lobby — one of many pieces curated by the LAX Art Program which features local and regional artists and aims to enhance and humanize the travel experience. Brewer's large-scale oil paintings reference abstract images inspired by NASA's efforts to map dark matter, the invisible gravitational entity that orders galaxies into clusters, using the Hubble Space Telescope. Spend a layover discovering the history of commercial aviation. Located before security in San Francisco's International (SFO) Terminal, the Louis A. Turpen Aviation Museum is part of the SFO Museum in an adaptation of the airport's 1930's passenger lobby. Learn about the innovative clipper ships that took the first flights across the Pacific Ocean with "China Clipper" or see aircraft development over the years through the model aircraft collection, "Aviation Evolution," from the 1903 Wright Flyer to today's airliners. For over 30 years, Michael Hayden's "Sky's the Limit" has been captivating our customers as they traverse the underground walkway from Concourse B to Concourse C in Terminal 1 at Chicago O'Hare's International Airport (ORD). With mirrored ceilings, thousands of feet of undulating rainbow neon lighting synchronized with music, the tunnel invites you in to be part of the experience. Whether as a welcome home to Chicagoans or merely a stop on your journey, it is always a sight to behold. This holiday season the airport was the destination in Denver. Travelers enjoyed a break from the terminal at Denver International Airport's (DEN) third annual ice rink, that we sponsored. Set up between the terminal and the airport Westin hotel from November to January, you could stretch your legs and skate through your layover with free skating and skate rentals. Local barbeque is cooked on-site at Q in Houston's George Bush Intercontinental Airport. Dig into traditional Texas barbeque like brisket, ribs and Texas sausage all smoked right in the middle of Terminal E — you can't miss the vast copper tubing that carries the smoke outside. Serving breakfast through dinner, you can get a taste of Texas all day long. Check out one of these unique Hub airport locations yourself by visiting united.com or use the United app.